Twenty years ago today I was in Warsaw preparing to present my first ever live concert, and I could hardly have chosen a more publicised event. 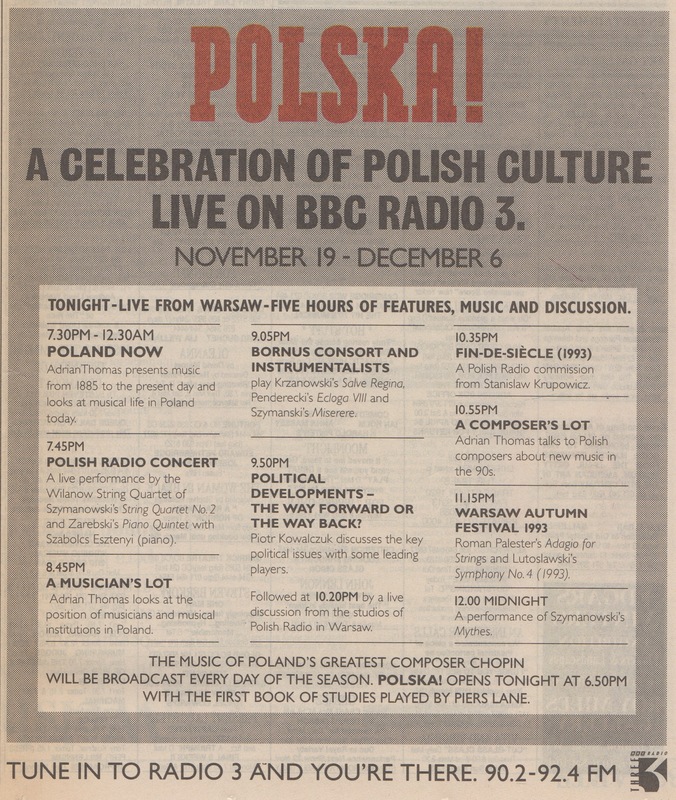 I was at Studio S1 at Polish Radio, broadcasting to BBC Radio 3 for the opening concert of Polska!, the most extensive celebration of any nation’s culture mounted by a single BBC channel. For 18 days, from 19 November to 6 December 1993, Radio 3 broadcast over 120 separate programmes involving producers, writers, performers and broadcasters not only from the musical world but many others too: poetry, fiction, drama, art, cabaret, history, cuisine, politics. In late 1992, I was working as Head of Music at Radio 3. I was wondering how the station might celebrate the 60th birthdays, at the end of the following year, of Krzysztof Penderecki (23 November) and Henryk Mikołaj Górecki (6 December) as well as mark the 80th birthday of Witold Lutosławski at the start of the 1993. (Little did we know that Lutosławski had already been diagnosed with cancer as Polska! began and that he would die in February 1994.) I went to discuss the idea of a festival with the Controller of Radio 3, Nicholas Kenyon, and we quickly realised that we had the resources to organise something really special, involving not only all the BBC orchestras and the BBC Singers but the other departments which contributed to the rich variety of Radio 3’s programming. If I remember correctly, it was Nicholas Kenyon who came up with the title and he was unreservedly enthusiastic and encouraging. And so Polska! was born. 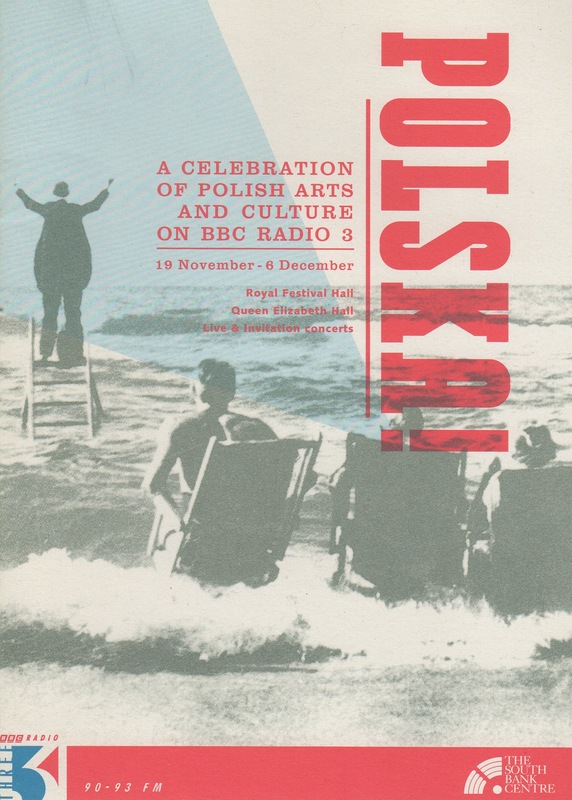 Over the next 18 days, I will be posting occasionally about Polska!, its live and recorded music repertoire, its non-musical programmes, the press coverage in the UK and in Poland, and including as many direct images of press reviews etc. as possible. Although I had left the channel at the end of June 1993, I remained deeply involved in the planning and programming of Polska! and was slated to do some of the presentation, both in Poland and the UK. Hence my ‘continuity’ presence in Warsaw on 19 November. A flavour of the musical breadth of the festival may be gathered from that evening’s five-hour opener, ‘Poland Now’ (a second blockbuster came towards the end of the festival). 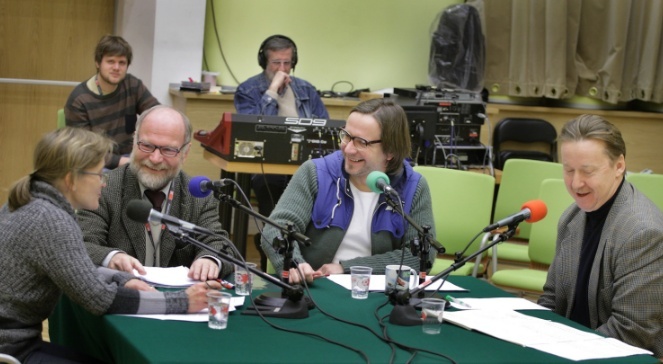 The opening evening’s main feature was the live broadcast from Polish Radio 2. The first half was devoted to chamber music (I was intent on including the then-neglected Zarębski Piano Quintet, which today has a deservedly higher profile), while the second consisted of contemporary vocal repertoire (including Paweł Szymański’s recent Miserere, a commission from Polish Radio). In the interval, for ‘A Musician’s Lot’, I talked with Szymański and two other Polish composers – Rafał Augustyn and Zygmunt Krauze – as well as to the pianist Paweł Kowalski, to Monika Strugała, one of the organisers of the choral festival Wratislavia Cantans, to Elżbieta Szczepańska, Head of Promotion at the music publisher PWM, and to Andrzej Rakowski, a professor at the Chopin Academy of Music in Warsaw and the author of a recent report on music education in Poland. In the 45′ profile of Polish political life – still a compelling issue four years after the ‘Round Table’ conference of 1989 had restored a level of democracy to the country – Piotr Kowalczuk was joined by Krzysztof Bobiński (Financial Times), the writer and lawyer Wiktor Osiatyński and Andrzej Wróblewski (Polityka), among others. 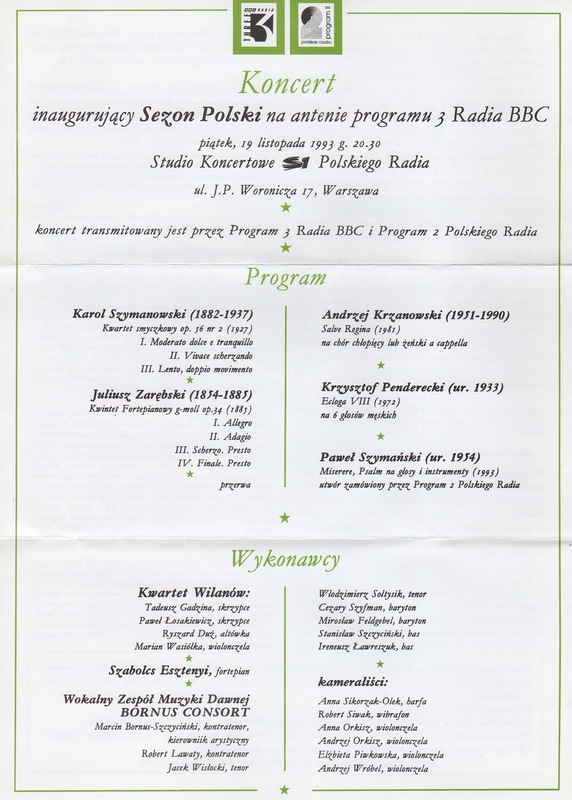 A second recent Polish Radio commission followed – Stanisław Krupowicz’s Fin-de-siècle, introduced by the composer and performed by WOSPR (Polish Radio Great SO), conducted by Takao Ukigaya. For ‘A Composer’s Lot’, I was joined again by Augustyn, Krauze and Szymański, by three other composers, Krupowicz, Hanna Kulenty and Marta Ptaszyńska, and by Grzegorz Michalski from Polish Radio 2 and Elżbieta Szczepańska from PWM. We were then able to draw on that year’s ‘Warsaw Autumn’ festival when Lutosławski had conducted a complete programme of his own music with the Warsaw PO (it turned out to be his last appearance on the podium in Poland). He talked with me about the Fourth Symphony to introduce the broadcast. Palester’s Adagio for Strings (1954) was performed by Sinfonia Varsovia under Jan Krenz. The evening had begun with a specially recorded performance by Piers Lane of Chopin’s Etudes op.10 (virtually all of Chopin’s music was played during Polska! and Lane bookended the festival on 6 December with the Etudes op.25). It ended with Szymanowski’s Myths and, like every subsequent evening of the festival, the last notes were left to one or more of Szymanowski’s mazurkas. I’ve been an advocate of Juliusz Zarębski’s Piano Quintet for years and so I’m delighted that Hyperion has just released this new recording. It’s accompanied by the Piano Quartet by his slightly older compatriot, Władysław Żeleński. If you haven’t come across either composer. you’re in for a treat. Zarębski in particular is a gem largely hidden outside his native Poland, even though in his short lifetime (he died of tuberculosis aged just 31) he was renowned across Europe as a stupendous pianist. A pupil of Liszt, he wrote mostly piano music, some of it stylistically advanced for the time. He composed the Piano Quintet in the last year of his life (1885), and I don’t think that I’m overstating it when I assert that it rivals any other example of the genre. One of these days, it will be more widely recognised for the masterpiece that it is. Here’s the link to my booklet note for Zarębski and Żeleński, or you can scroll the CD NOTES tab above. Here’s another link, this time to an earlier post about the Zarębski Quintet, plus one I wrote a few weeks ago on Zarębski, Zarzycki and Żeleński. NEWSFLASH! In its review, the BBC Music Magazine (Christmas issue 2012, p.93) awarded the CD ✭✭✭✭✭ for Performance and ✭✭✭✭✭ for Recording and also made it its ‘Chamber Choice’. Thoroughly deserved – bravo to Jonathan Plowright and the Szymanowski Quartet. It was also nice – and unexpected – to read the last sentence: ‘With the inclusion of Adrian Thomas’s expert sleeve notes, this represents another invaluable Hyperion release’! NEWSFLASH no.2! On Radio 3’s CD Review on 9 February 2013, Andrew McGregor gave an enthusiastic response to this CD, also drawing on what he called “Adrian Thomas’s excellent notes”. Thanks Andrew! NEWSFLASH no.3! Jonathan Plowright has passed on to me a ✭✭✭✭✭ online review in Audiophile Audition, dated 13 February 2013. It ends: ‘Adrian Thomas’s excellent liner [notes?] tell some intriguing musical stories[.]’. NEWSFLASH no.4 and no.5! Another great review for this CD from Steve Arloff, including several references to the notes, including ‘the excellent booklet notes’: online review on MusicWeb-International. Previously on MusicWeb-Interntional, its Classical editor Rob Barnett also posted an enthusiastic review, including the comment: ‘Adrian Thomas provides the much-needed commentary and does so with both style and sterling content’. I’m about to engage in a labour of love: writing a CD note for one of the ‘forgotten’ masterpieces of 19th-century music. The name Juliusz Zarębski (pronounced Yooliush Zarempski) is hardly known outside his native Poland, but in his time he was one of the most famous pianists in Europe. 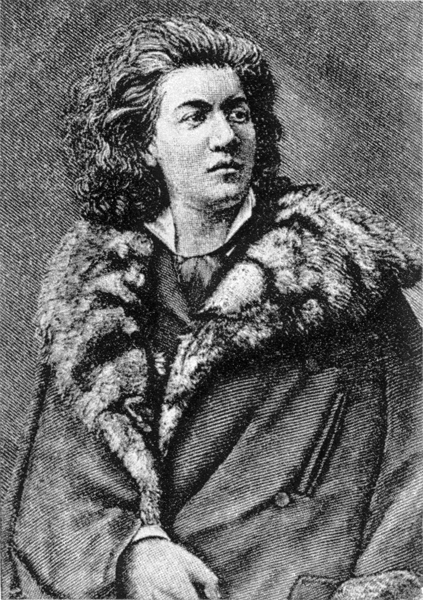 Zarębski (1854-85) was one of Liszt’s pupils and started teaching at the Conservatory in Brussels when he was in his mid-20s. But, like too many of his contemporaries, he succumbed to tuberculosis and died when he was only 31. I am a passionate advocate of Zarębski’s Piano Quintet, which he completed shortly before he died, and it is very exciting that a new recording will be issued here later this year (I can say no more!). There have been over a handful of CD recordings already, but none has penetrated the market much beyond Poland. Yet major figures have performed it: Martha Argerich played it in Poland last year. I remembered yesterday that I had a written a little piece on Zarębski for a Polish CD magazine, Studio, about 15 years ago. So, as a tribute to the composer, who was born on this day in 1854, and in an attempt to whet the appetite for the new CD, I’ve reproduced the article below (unaltered except for a few recording updates) and intercut it with YouTube videos of a concert performance given by the Bulgarian Quarto Quartet with Darina Vassileva on 12 April 2010. This is a committed and fervent interpretation which brings out the work’s great strength, passion and originality. Last October, returning to London from the Warsaw Autumn, I glanced at a notice hung on the railings of the church at the end of my street. I was quite taken aback to see that, later that day, there would be a performance of a chamber music concert including the Piano Quintet by Zarębski. Now, you could count on the fingers of at most two hands the number of live performances this work has ever had in the United Kingdom (it is less well known than Górecki’s Third Symphony was before the Upshaw/London Sinfonietta recording). I suspect that Zarębski’s Quintet is just as neglected in other countries too. This plainly is a scandal, and the reaction of the audience to the performance I heard in October was one of wonderment that such a work could exist and yet not be as familiar as piano quintets by Schumann, Dvořak, Franck and Brahms. I first came across Zarębski’s Quintet in the CD recording by Waldemar Malicki and the Varsovia Quartet (Pavane ADW 7218, rec. 1989), and there have been subsequent CDs by Szabolcs Esztényi and the Wilanów Quartet (Accord 201332, 1990) and Jerzy Witkowski and string quartet (Olympia OCD 383, 1992). [2012 update: more recent CDs include Paweł Kowalski and the Silesian Quartet (PNCD 404, 1997), Malicki again, this time with the Amar Corde Quartet (Amar Corde 002, 1997), Krzysztof Jabłoński and the Warsaw Quintet (DUX 0530, 2005) and Wojciech Świtała and the Royal Quartet (Bearton CDB036, 2006).] Some of Zarębski’s music for solo piano is now also available on CD – Les roses et les épines (Katarzyna Popowa-Zydron on Accord 201332, 1990), Lullaby, Tarantelle and Grande polonaise (Elżbieta Wiedner-Zając on Dorian DIS-80121, 1993) and the first CD of the complete Zarębski played by Karol Radziwonowicz (Selene CD-s 9505.28, 1993). All of these recordings have appeared since 1989, marking a turning point in the public’s access to what remains for most a figure shrouded in romantic myths and mists. Who was this Zarębski? Does he appeal because he died of tuberculosis aged only 31 (in Żytomierz in 1885)? Or is it because he was a phenomenal pianist taught by Liszt? Or perhaps it is that he had been caught up in that curiously nineteenth-century Belgian fad for creating outlandish musical instruments? 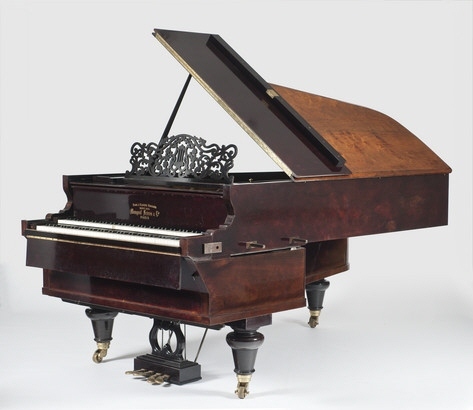 I, for one, would have loved to have been in the crowds that flocked to hear Zarębski at the Paris Exhibition in 1878, when he wowed audiences as he played the two-keyboard piano invented by Eduard Mangeot. Unlike other double-keyboard monsters, Mangeot’s had the bizarre distinction of having the top keyboard running in the opposite direction (the bass to the right, the treble to the left) to the other ‘normal’ keyboard below. Unfortunately for us, Zarębski’s performing genius died with him and his compositional output was very small – 34 acknowledged opus numbers plus a few miscellaneous pieces. Of these, the Piano Quintet – his last completed work, finished in 1885 – stands supreme. It is one of those works (Szymanowski’s Stabat mater often has a similar effect on the unwary listener) which communicates immediately and powerfully in its individuality, even though it stands well outside the canon of mainstream Western classical music. Certainly, it shares several traits with a predecessor like the piano quintet by Brahms (1864), although I am more inclined to link it, however tenuously, with the lyrical freshness of another unjustly neglected Polish chamber work, the youthful Piano Quartet (1879) by Zygmunt Noskowski (recorded by the Polish Piano Quartet on Olympia OCD 381 along with Żeleński’s Piano Quartet). But contrasting Zarębski with Brahms is more likely to point up differences than similarities. Where Brahms is structurally conventional, Zarębski experiments (on the simplest level, there are no repeat signs). Where Brahms is portentous and grave, Zarębski is openly exultant. Where Brahms has problems of instrumental balance, Zarębski is clarity personified. Now, don’t get me wrong, I love the Brahms quintet, but Zarębski brings something new and compelling to the genre. First and foremost, he has an astonishing melodic gift. Who can fail to be moved by the sweep and passion of the opening? And yet, daringly, Zarębski cuts this short as he shoots forward to an even more lyrical idea. There is no sense that he is obeying any received rules of sonata structure, and when the third lyrical (and characteristically melancholic) idea is introduced, we might be forgiven for thinking that the composer lacked a certain dynamism. But again Zarębski shows his skill as he uses his material to develop a sustained peroration. Having explored his first idea so strongly, Zarębski curtails the recapitulation (a masterpiece of concision), moving inexorably towards an end that has not one but two propulsive codas, separated by a moment of reflection. Perhaps the most winning aspect of Zarębski’s compositional inspiration in the Piano Quintet is the sheer subtlety of expression. The second movement is a beguiling mix of rhythmic and tonal wrong-footing (the downbeat and key at the opening are not where they seem to be) and of the seemingly introverted nature of the main melodic idea, which later flowers into something quite overwhelming in its harmonic and melodic dimensions. At the end, Zarębski reintroduces the opening bars (again off-beat and in another unexpected tonality) not at the recapitulation but as part of the coda. Nothing can be taken for granted. The quality of understatement is frequently apparent, especially in the way Zarębski meshes the piano with the strings. The piano is genuinely primus inter pares, even though, as in the Scherzo, it initially takes the lead. This is a real scherzo in the sense that it teases rhythmically (it is a slightly jokey galop), thematically (a ‘downhome’ idea subsequently treated fugally), and texturally (beautiful and delicate use of string harmonics). Furthermore, it is a structurally extended movement with another lyrical section at its centre. We shouldn’t be surprised that the finale revisits ideas from earlier in the work. The way in which the finale begins as if the composer has decided to start the Scherzo all over again from the beginning is an imaginative twist to the by then accepted notion of thematic or cyclic integration. Having wooed us in previous movements with his lyrical gifts, the predominant tone of the finale is one of extrovert exuberance, by turns folksy and deeply romantic. As throughout this masterpiece, Zarębski astonishes us by the bold swerves with which he manipulates both his material and us, the listeners. To make a dubiously crude analogy, it is like being on the shoulders of a world champion skier as he negotiates a mixture of cross-country and downhill terrain. The sense of exhilaration engendered takes the breath away. As to the music for solo piano, much of this is still languishing in obscurity. Is this situation justified? There is a decidedly more overt Polishness in many of the pieces than in the Piano Quintet. In addition to conventional and often showy miniatures (waltzes, menuets, etudes and serenades), there are mazurkas and polonaises, almost obligatory calling-cards for nineteenth-century Polish pianists. The most impressive of them all is the Grande polonaise in F sharp minor, Op.6, which brings together limpid Lisztian figuration and a thematic and rhythmic élan which proclaims strong links with Chopin’s own F sharp minor Polonaise. And yet, as in the Piano Quintet, Zarębski takes us beyond the standard structural expections of a polonaise into realms inhabited by Chopin’s Polonaise-fantaisie. The scale is symphonic (it lasts c. 10 minutes), the style bravura. A thoughtful Chopinesque influence may be felt in the Ballade in G minor, Op.18. It is a truism, here and elsewhere, that Zarębski the composer rarely indulges in showmanship for its own sake – there is always a core of ear-catching material which sustains both the introvert and extrovert sides of his musical persona. Much has been made of Zarębski’s prophetic harmonic explorations in his later pieces, aside from the Piano Quintet. His innate lyricism was a natural counterpart to harmonic experiment, and early signs of this trait may be heard in Les roses et les épines, Op.13. 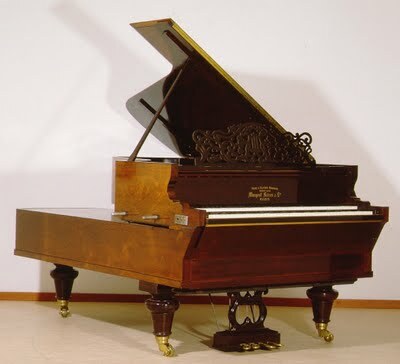 The opening Andante con moto, for example, belongs to the genre of semi-pictorial mood pieces for solo piano beloved of Liszt and which anticipate Ravel. The texture is suggestive rather than emphatic, although the type of impassioned harmonic-melodic lyricism encountered in the Piano Quintet is already fully formed here. The sense of veiled detachment continues in the second Andante con moto (the third movement), with its short and elliptical phrases. It cannot quite be claimed, however, that Zarębski went as far as Liszt did in contemporary works like Nuages gris or La lugubre gondola (1881-2). In this light, it may seem strange that it is the nominally conventional dance movements of the Suite polonaise, Op.16, which, as Stanisław Haraschin has commented, have ‘a distinct tendency towards tonal ‘decomposition’, strident and unexpected modulations and harsh polyphonic phrases’. Their deceptively simple textures mask an almost deconstructivist approach to miniatures which by the 1880s in other hands had become overburdened with saccharine sentimentality. Such accretions were evidently not to Zarębski’s taste and his music at all times strives for direct expression as well as for fresh extensions of his compositional boundaries. In this sense, his renewal of familiar genres looks forward to Szymanowski’s music for solo piano, notably the mazurkas. The textural clarity and sparse harmonies of the Berceuse, Op.22, and the very adult insouciance of the suite for children, Étrennes, Op.27, continue Zarębski’s search for an increasingly lean and ‘classical’ means. Slight they may be, but these ‘New Year Gifts’ are incredibly elegant and soignées, provoking suggestions of anticipations not so much of Debussy as of Satie and Ravel. The sense of what in French hands became recognised as neoclassical is reinforced in Zarębski not only in antique titles (see also the Gavotte, Op.29) but in the melodic and harmonic style, with its turns, runs, grace notes and cadences that recall any number of 18th-century composers. So where does that leave Zarębski as a figure in the musical world of the late 19th-century? Certainly someone to be treasured, someone whose compositional vision was international not provincial. Until his music becomes more readily available – in print, on air and on disc – it is hard to make a comprehensive case for him in the pantheon. But, on the basis of works like the Grande polonaise, Les roses et les épines, and above all the Piano Quintet, he deserves recognition as a master whose music adds immensely to our understanding and appreciation of the transition between high romanticism and the 20th century.